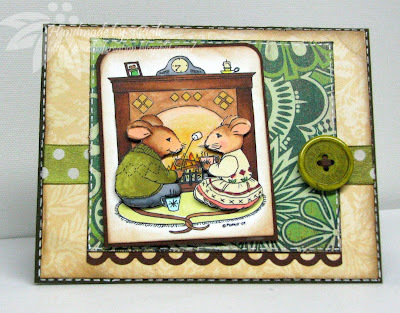 This week's SSD challenge is to create a New Year's project..
Creative Card Crew: Anything Goes.. Crafty Creations challenges: No Rules ..
Cupcake Craft challenges: A Time For Celebration. Pile it on challenge: Anything Digital.. 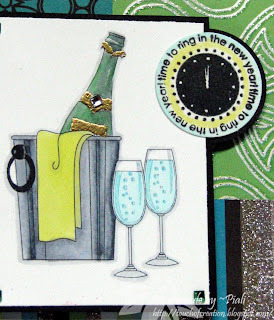 Stamp with fun: "Happy NewYear"
Paper cutz challenge: New Years..
Everybody Art challenge: Happy New Year..
Paper play challenges:New Beginnings . Lili of the valley : A New Years' Card. 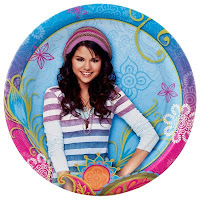 You will have until next Wednesday 01/06/2010, at midnight PST to play ! Make sure to use a SASSY STUDIO image and link your creation HERE. 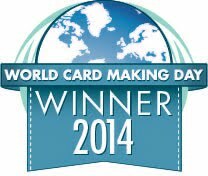 A winner will be announced on Friday 01/08 The winner will receive their choice of 2 SSD images!! Happy Sunday!! hope you all are having a wonderful holiday time.. 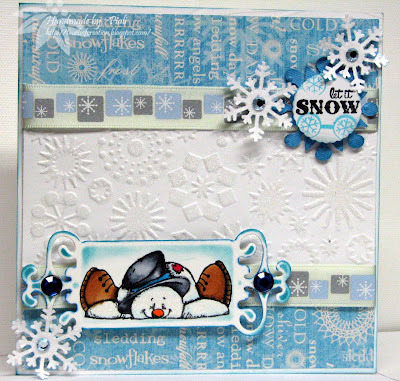 So here is my card with lots of snow...snowflake DP , snowflake embossing folder, snowflake ribbon, snowflake punch and on the top cute snowmen image....this image is from swap..love it. 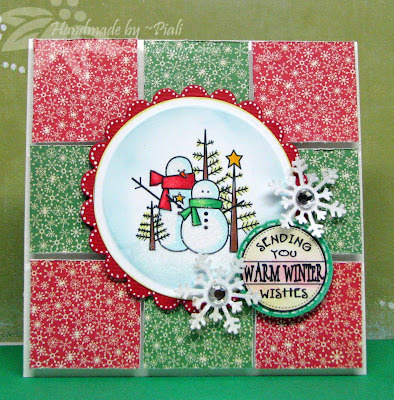 This week we have a fabulous prize of $25.00 gift certificate from Stamping Bella..
Hope you all will join in for snowtaular fun....Can't wait to see your creations this week..
Hope you all had a great weekend.... Its my turn again to host InstyleStamps METHOD MONDAY. Okay!! so whats Method monday...on every monday one of ISS fabulous DT members share a tutorial with you all. If you are like me and still have few more gifts to make ..my this week's tutorial is perfect for gift giving..
Its a shipping tag treat holder..if want to make one ,check out the tutorial HERE.. This last minutes treat holder is also for few challenges..
Allsorts challenge : Anything but card..
Papers: SEI , Making Memories. Copics, Nestabilities, Ribbon, Eyelets, scor-tape, button. A Card... few more challenges. I'm back with a card...using one of fave The Character Cafe image--- Pax Penguin. Its last minute gift for one who loves penguin a lot..ssshhhh can't say WHO.. 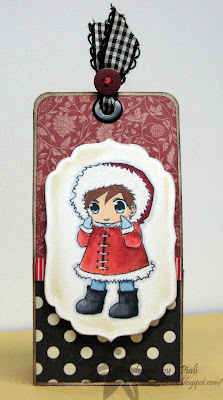 He is super cute....I also used my New Spellbinders fancy label die for it. Dare U 2 digi stamp: Last minute Christmas card..yeah its a last Christmas card and gift combo. If the shoe fits scrap it: Color your World. Creative Card Crew: Anything Goes. 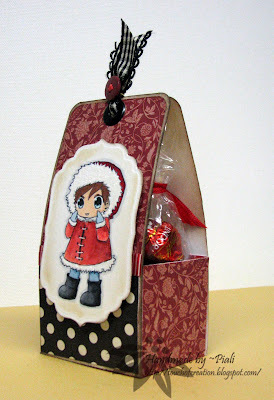 One stop craft challenge: Christmas love.. 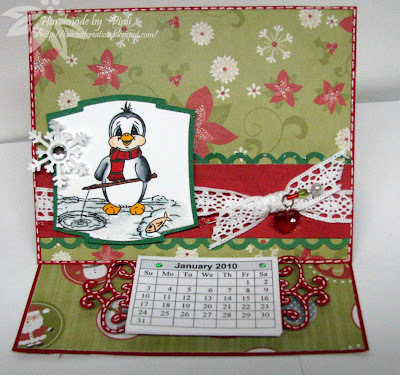 Crafty Calendar challenge: Winter Sparkle. 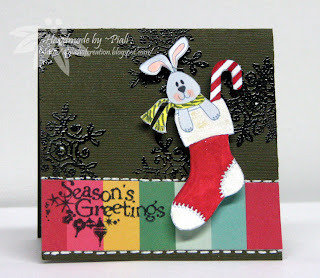 Daring Cardmakers: New Beginnings....so a New Year Calender..
Simon Says stamps challenge: Merry Christmas. 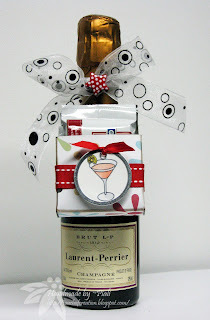 The Secret Crafter Saturday challenge: Last minute gift.. I have to make few more last minute gifts... I'll back with few more projects tomorrow. Labels: corrosive challenges, crafty creations., create4fun, dareu2digistamps, daring cardmakers, mojomonday, onestopcraft, quixotic paperie, secret crafter saturday, simonsaysstamps, thecharactercafe. Stamptacular Sunday Challenge ~ Multi-folds. I made a stair-step card.. This week we have a fabulous prize from SIMON SAYS STAMP..
Be sure to add a direct link to your project HERE by midnight (EST) December 26th, 2009. Project Tuesday Challenge..you can find the link to tutorial there .. 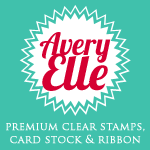 Welcome to InStyle Stamps Love and Romance Blog hop! If you are here from Margie's blog..you're right on track ...if you are just joining me now ,please go back here to start.. So here is my card with the super cute couple..."DATE NIGHT" ....such a romantic happy image..love it. Visit all our Fabulous DT members and enjoy thier creations..leave a comment ..and be sure to head over to ISS Blog to vote for your favorite DT project ...Then, in order to be entered into the drawing to win the grand prize, leave your name with Mister Linky. You have until 11:59pm EST on Sunday, December 20th to enter, and the winners will be announced on the InStyle Stamps blog on Monday. 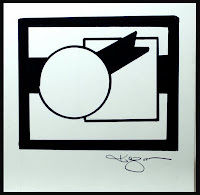 Sorry I'm late....this post was scheduled for yesterday..Mr. blogger really dislikes me ,I think..didn't work again. So I have also added a fresh news to my post now..
First...Its time for another fabulous Instyle stamps OHDBC giveaway...the theme of the month is "NEW YEARS" . 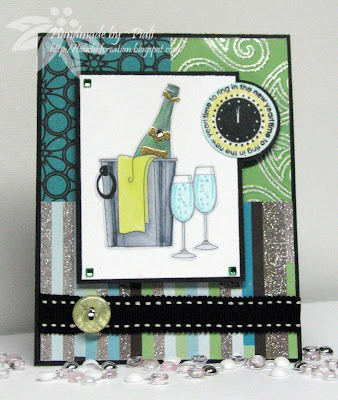 Challenge is to create a New Year's themed card or project using an InStyle Stamp image. 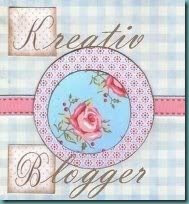 Now I have received two wonderful blog awards from two great crafty friends of mine. Thank you Sara .. she is a very talented crafter and wonderful DT sister too..I'm lucky to work with her . Thank You CJ'Smom of Aud Cards...I met her while a bloghop..she is very sweet blogger always leaves me sweet comments and love. Today I received an email from Justine of Abc toys and crafts..mentioning that I will be one of their new Design Team member from Jan 2010 ..
Be sure to stop by Abc Design blog ..they are having a fantastic giveaway worth $200 ...the drawings will be held on Dec19th..
Sassy Studio Designs' Stocking Stuffers Release .. 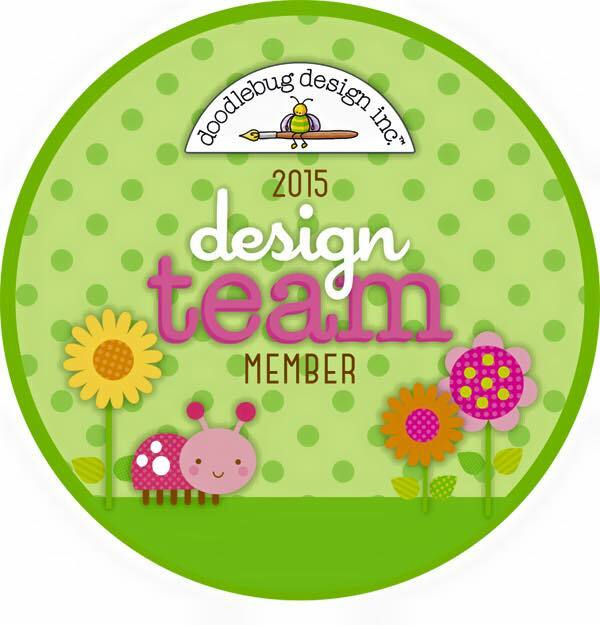 Welcome to Sassy Studio Designs~ Stocking Stuffers Release bloghop. This time of year we look for itty-bitty goodies which will be the perfect stocking stuffer..so Lindsay has provided us with fabulous crafty stocking stuffers..a lovely collection of $1 images perfect for last minute quick projects . I have some very easy quick cards ...I used the a piece of border paper from Bella Blvd.. a simple punched border and our Sassy PACKAGES...its a 8 minutes creation. 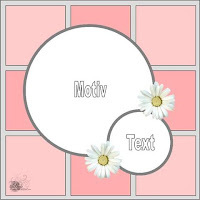 These new images are super fun to play with ...I made some little 3"x3" cards for the teacher's gift too..
Cameo images are my favorite ones..its so easy to use ..you can just punch it out or use with nestabilities..even simply trim it by hand. then layer it with a Scalloped circle..a scrap piece of ribbon...TaDa! quick card.. I will try out some other images too for my cookie package tags..yeah! every year I bake cookies, brownies ,fudges and fruitcake for all my friends . I make breakfast baskets for the Christmas morning with my homemade goodies, coffee and chocolate..and give it to all the guest families of my Christmas Eve party ...so that they all enjoy their morning.. opening the gifts and spending time with their families rather than cooking.. its not exactly my family tradition but something I love to do every year.. So what is your family tradition??? Be sure to leave a comment at SSD Party Blog answering this question to win..
ONE winner will win THREE new release images and 2 ALREADY released images! 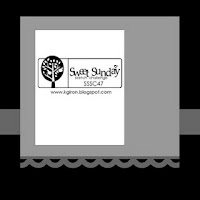 Visit all SASSY DT blogs and enjoy their creations ...don't forget to leave some love at each stop. We will be chatting at SSD Party Blog from 7PM-9 EST..please join in for fun , Limited Edition Blinkie and the prize. 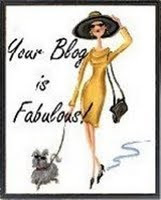 NEXT STOP IS SARA'S BLOG.....so hop on over and have fun..
Hope you all had a fabulous weekend. My daughter's class needs a big card for their teacher..so that 20 of the third graders can sign on it. Sophisticat challenges:IT'S XMAS THEME....ANYTHING GOES. The Pink Elephant challenge: Winter and/or Christmas . 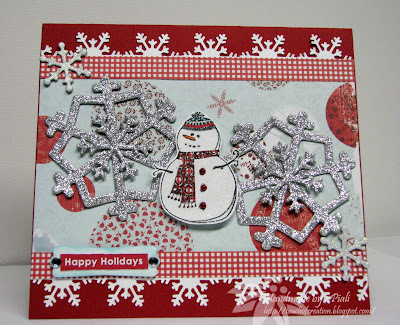 Pile it on challenge: Chip Chip..I used layered chipboard snowflakes. Die cut Dreams : Glitter me silly..
Simon says stamps challenge: Let it Snow..
Its also my first time entry for Raspberry Suite Color Challenge...I used the Justrite Stamps for it.. I love Kraft cardstock , it makes a great base for any color palette. Paper Take Weekly: Red and Green must not be seen. Creative Card Crew: Gold or Silver..so I used gold. Papers: American Crafts cardstock, Basic Grey, K & Co.
MS Border punch, Ribbon, Gems and pearls,gold leaf pen, Distress ink. Happy Sunday! You all must be very busy with the holidays prepwork..I'm still trying to finish up mine. Christmas theme without using the traditional Christmas colors. So here is my card..
Love this combo...Brown and Gold. 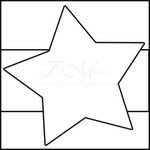 This week ..we have two fabulous sponsors..
Prize: One downloadable template of winner's choice. 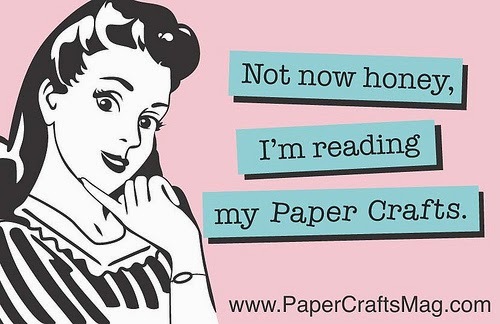 Paper: K & Co., American Crafts. Gold Embossing powder, jeweled brads, bling ,ribbon. You all are the lucky ones , you can join to win the fabulous goodies..I wish I had a chance to enter..lol. I love Lauren Meader's template. Make sure to upload the direct link to project here..can't wait to see your creations ..
Today I have quick sneak peek of the forthcoming Sassy Studio Designs~ Stocking Stuffers Release. Lindsay has planned for a fun release .. 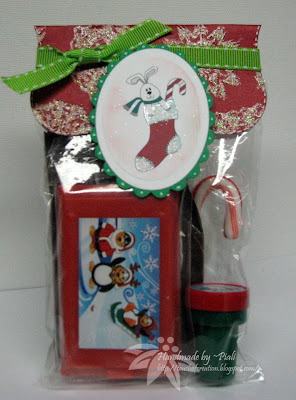 I used this cute stocking image for little treat bags ...for my little ones classmates. I have completed only 2 ....yet 18 more to do.. I should go back and make some more...be sure to check SSD blog on Dec 15th for the release deets.. This week ..I found out two fabulous Digi store... very different style of images but fabulous. Softpencil Challenge #10: Two or more layers. So cute..cozy couple..just like ..its Christmas Eve..love it. Moxie Fab World: All Creatures Great & Small-- use some kind of critter. Papers: Basic Grey,Cosmo Cricket, American crafts. Images: Girl~ Soft Pencil and Cozy Place~ Phindys Place. Copics, MS Border Punch,Fiskar border punch, Bling,Button, White Gel pen. More challenges you enter with TCCimage, the more ballots you get..for the Blog Candy.. 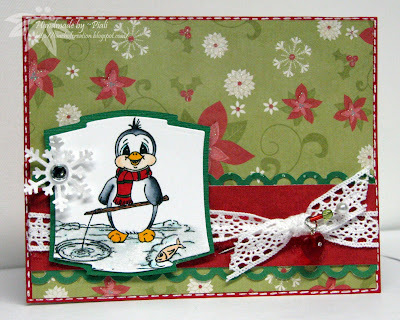 Daring cardmakers: Dotty...I used Cuttlebug Swiss Dot folder and Polka dotted ribbon. Cupcake Inspiration Challenge: I picked the colors.. The cuttlebug spot: Christmas Gifts..
Creative Card Crew: Gold or silver..I have both. The Pink Elephant challenge : Favorite Christmas combo..red green..and white. Dareu2digistamp:Red, Green + your choice of neutral. Pile it on challenge: tinsel town.. 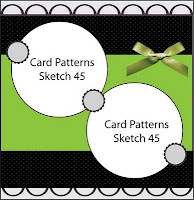 The secret crafter saturday challenge: Matching set. Charisma cardz : RED, GREEN AND A CHOICE OF EITHER WHITE OR SILVER! Clearly I stamp: Winter theme. So if you want to join in for super fun challenges...post a direct link to your project HERE. A card with Sweet treat image or some really sweet treat gifts.. So here is my take on the challenge.. The color scheme is from Color throwdown challenge#72..
2 Red Bananas: Stay Warm. Secret Crafter Saturday challenge: Matching set. Caardvarks: Digital Showcase...I used digi Image from Sassy Studio Design and colored it digitally too. Frosted Designs: Scallop...I used scallop circle and Scallop border. 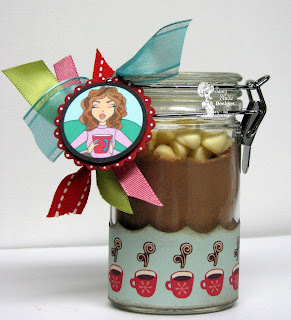 So join in for the Sweet Treat fun..Make sure to use a SASSY STUDIO image and link your creation HERE!! A winner will be announced on Friday 12/18!! The winner will receive their choice of 2 SSD images!! Cupcake Craft challenges: ***SING A CHRISTMAS CAROL***...For me its " let it snow"
Dare U 2 digi stamp: Red ,Green and neutral. 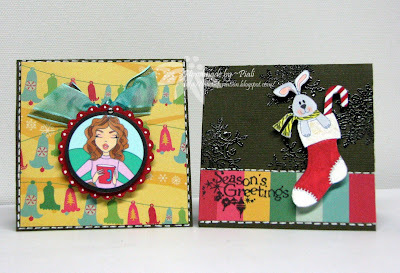 Paper Cutz challenge: Christmas image. 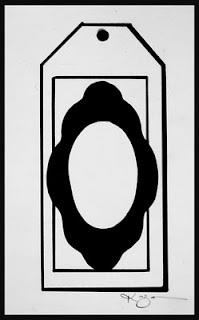 Caardvarks: Digital...image and sentiment are digital. The Pink Elephant challenge: Your Favorite Christmas Color Combo..mine is Red and green. Pile it on challenge: Tinsel town. Simon Says stamps challenge: Let it Snow. Inky Impressions challenges#25: ADD SNOWFLAKES . Stampavie and more:Red and Green. Wow !! a long list of challenges.. Image and Sentiment: Whimsie Doodles. 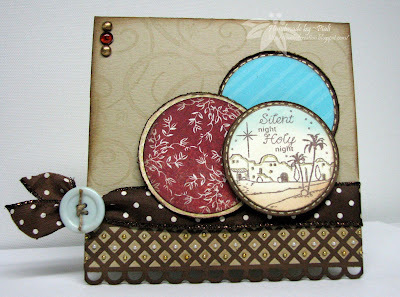 Stamptacular Sunday Challenge...Let it shine!